What is the hallmark of a qualified lead? In its broadest definition, any opportunity to make a sale is a qualified lead. Of course, not every lead is quite the same. In many situations, the path from qualified lead to sales prospect to loyal customer can take its share of turns along the way. In fact—depending on the type of industry, the logistics of the transaction, and what could be financially at stake for all parties involved—spending six months or more to successfully qualify and guide a lead through the sales funnel should be considered the norm, not the exception. Often, your initial contact is not the actual person with the interest or intent to purchase your product or service. But don’t get discouraged. Sometimes, a lead can satisfy your qualification process criteria based on their potential to influence a sale, such as providing an introduction or divulging key insights about the person with the actual power to make a buying decision. As leads are nurtured and continue to advance through different stages of your sales funnel, it may seem counterintuitive to actively reach out to a prospect—unless they are ready to buy. However, when it comes to sales lead qualification, that intuition could be entirely wrong. According to research by Dave Stein, sales consultant and author of Beyond the Sales Process: 12 Proven Strategies for a Customer-driven World, “the typical customer spends less than 5% of their time engaged in the buying of products and services” from their salesperson. The bottom line? Getting to know your customers and developing relationships is critical. Whether you manage sales for a small regional business or oversee the annual sales growth for a Fortune 500 corporation, having a better understanding of how to qualify a lead and asking the right qualification questions early on will differentiate you in a competitive sales environment. In this article, we will take a look at three ways to foolproof your lead qualification process. From the outside, sales may look like a numbers game. Get enough leads in your sales pipeline and perhaps you will be lucky enough to meet your quota. Ask any seasoned sales professional and they will tell you the numbers game is a myth. It takes skill, knowledge, and technique. Perhaps more importantly, you should approach each sale as embarking on a new relationship. In order for the relationship to develop, look for compatibility. When it comes to your lead qualification process and criteria, can you clearly show how your product or service uniquely matches your prospect’s needs? If not, you may be better off focusing your time elsewhere. Always remember, even when it comes to B2B, you are always selling to an actual person. Someone who expects you to listen and learn more about them. And understand their needs. Am I taking the time to understand the challenges and needs of my prospects? Am I making the effort to actively listen and ask the right qualification questions? Am I good at judging whether or not a lead is an ideal fit for the solution I provide? Check out more sales templates from Winning by Design. According to a 2016 study, as many as 63% of prospects are just "somewhat" or "not at all" knowledgeable about a company before a sales rep makes the first contact. If you really seek to qualify and nurture your leads through the sales funnel, you need to provide value and build trust with them long before the sale happens and continue to do so after the sale concludes. Lead qualification is part of a long-term sales strategy, one that requires consistency. And you need to provide a reason for would-be customers to become qualified leads in the first place. A better buyer experience starts with providing them with a valid reason or incentive to opt in and share their contact information. Building credibility with new lead prospects can be as simple as inviting them to subscribe to your e-newsletter or offering special access to a downloadable white paper, content you provide in exchange for a name, email address, and sometimes a phone number. Sometimes referred to as lead magnets, these forms of free (yet exclusive) content can help people decide for themselves if they meet your lead qualification criteria. However, this tactic can only be successful if you put a plan in place to follow up with your qualified leads. Am I providing value and building trust with customers before and after the sale? Am I developing any content that is useful or relevant to my would-be customers? Am I offering my prospects with any incentive to continue down the sales funnel? Given the complex nature of most B2B sales transactions and the many steps that comprise the customer journey, mapping out the sales process should be a standard operating procedure. However, an article by Entrepreneur recently revealed that 65% of all companies admit they have no process to nurture leads. Additionally, research by Salesforce suggests that an alarming 50% of sales time is wasted on “unproductive prospecting.” Sadly enough, this is not surprising. Too often, sales organizations assume that customer’s take a linear path in their decision process. In the past, a customer’s path through the sales funnel may have involved gathering information, meeting with a sales rep, narrowing down product choices, and making a buying decision. Today, social media and email marketing offer you effective yet inexpensive ways to reach new customers and keep them engaged throughout the entirety of your sales process. Mapping your sales process may sound difficult and time consuming. But the Lucidchart Sales Solution makes it easy. With our intuitive platform and helpful templates, you can easily visualize and implement your processes for use across your entire sales team. Not only does this ensures greater consistency, but mapping out your sales process also encourages teamwork. With a greater collaboration between your sales reps, your organization can close bigger deals faster and maintain a healthier sales pipeline— even when sales reps leave or change territories. 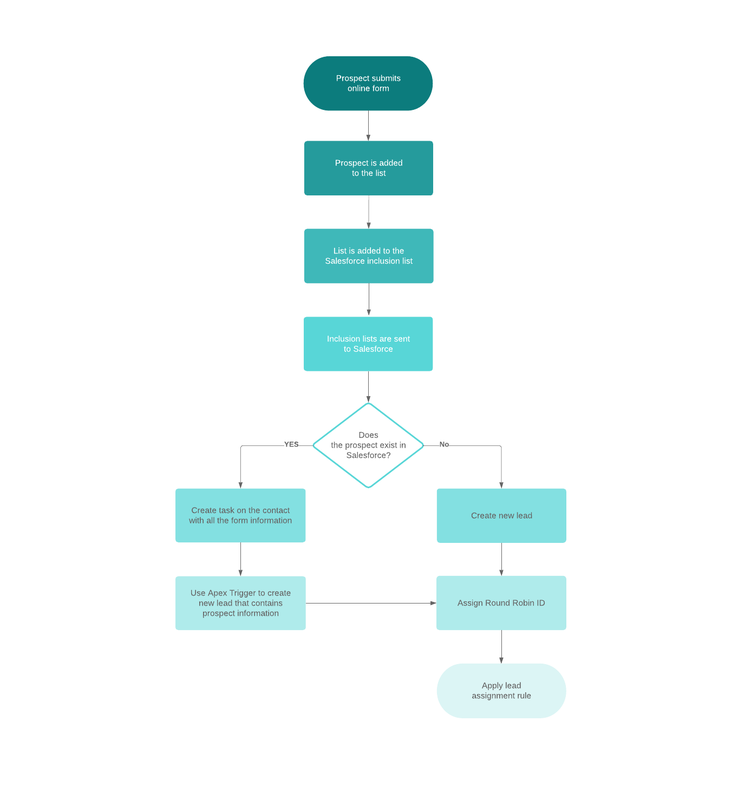 With Lucidchart, we keep it simple for your sales team to visualize process handoffs, rules of engagement, and the best practices for processing and qualifying leads. Sales managers also have the ability to evaluate current processes and implement changes as needed to reduce bottlenecks and inefficiencies. Plus, your sales reps can work independently and better leverage account information—all within an environment that leadership centrally owns and manages. 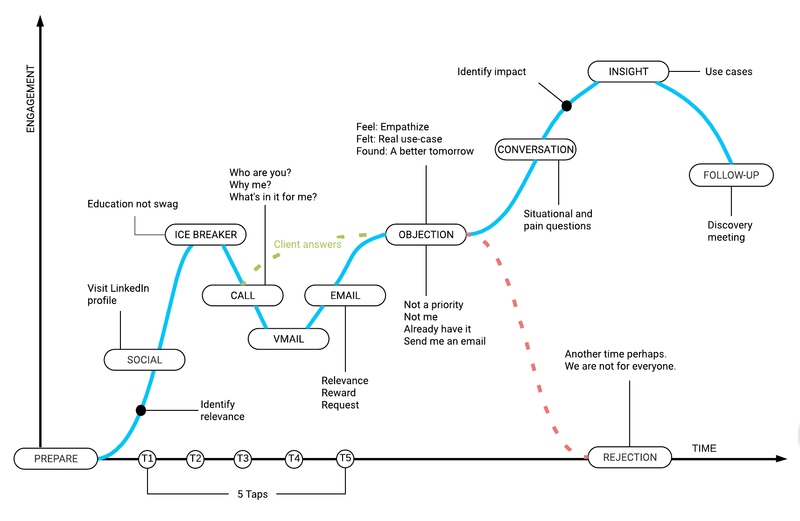 Am I providing my team with the tools to map out and understand our sales process? Am I empowering leaders to evaluate current processes and make improvements? Am I giving sales reps access to the resources they need to work more effectively? Better collaboration starts here. With Lucidchart templates, it becomes easy to map out your company’s lead qualification process and store it where sales reps can reference it quickly. Learn more about the Lucidchart Sales Solution.